It’s now… ooh, it’s now 10 days since D-Day, otherwise known as the day I kicked the Diet Coke. As a type 1 diabetic who follows a low-carb diet most of the time (not all of the time, as I’m not perfect and I find the occasional pull of the chocolate/bread temptation too hard to resist), in theory Diet Coke shouldn’t pose a problem. It’s sugar-free and carb-free after all. But drinking Diet Coke in the quantities that I did (one-and-a-half litres a day) definitely suggests addiction and who wants to be an addict? Google “giving up diet coke” and you’ll find lots of forums and discussion threads where people discuss their addictions. Other diet drinks are mentioned, but it’s Diet Coke that seems to form the commonality – suggesting that there is indeed something addictive in Diet Coke, even if that is just its psychological pull. I found plenty of people talking about the satisfaction of hearing the tab pop and hiss, or of clasping that ice-cold can in your hand on a warm day. I sympathised, even though of late I decided I preferred it in bottles. 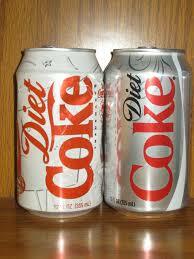 I started drinking Diet Coke about 20 years ago. When I was first diagnosed with diabetes, there was one diet fizzy drink on the market – Tab, and it was pretty nasty. Diet Coke was launched not long after I was diagnosed (in 1982), but it took a while to filter down to the rural backwater I lived in. Other diet drinks started becoming available in large quantities round about the same time, but by the time I reached my 20s, I found I only really wanted to drink Diet Coke. And drink it in huge quantities I did. Health – Examine.com conclusion aside, who wants to ingest all those chemicals on a daily basis? Money – a coke habit is seriously expensive. Like many of the Diet Coke addicts I found online, I insist only on the Real Thing, and I won’t buy it in big bottles to save money. Coca-Cola. Seriously, who wants to hand over huge amounts of money to Coca-Cola? The Environment. Ahem, again because I only want to drink small bottles of coke, it added up to a lot of plastic bottles going into the recycling unit every fortnight. So, I’m now at day 10. I’ve replaced the Diet Coke with fizzy water, courtesy of my Soda Stream, and cups of peppermint and nettle tea. I haven’t tried to replace the caffeine, or the sweetener as I think I’m probably better off without them. I’m not inexperienced at giving up Diet Coke. This must be… ooh, at least attempt number 10, the longest period without lasting some two years. But fingers crossed this time is the last time I say good-bye to Diet Coke. Previous Post What if that amputation wasn’t necessary? Next Post What’s new for type one diabetics? Well done Emma! Stick at it. I chucked the red wine(and all other booze and chocolate and ice cream too) for two and a half weeks…..but then relapsed. Diet coke addiction is a real phenomenon. I have met several colleagues and patients with the same problem. I wonder if “diet….” is the problem. “Diet chocolate” “Diet steak au poivre” “Diet vanilla ice cream with diet flake” “Diet chips and diet mayonnaise” “Diet toasted cheese”. I reckon that prefixing anything with “diet” is like a green light, egging you on to do it. Thank you Katharine – 11 days now… It’s most definitely a phenomenon, and I agree it’s partly that “diet” prefix egging you on, as well as the caffeine jolt you get from DC.